We kicked off our annual 100 Acts of Kindness challenge last week! As part of our challenge, each week we are issuing a kindness challenge! 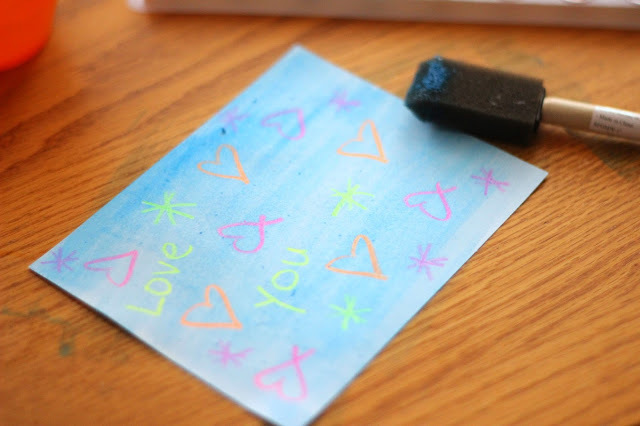 Last week Megan at Coffee Cups & Crayons challenged us to surprise a stranger with an act of kindness. 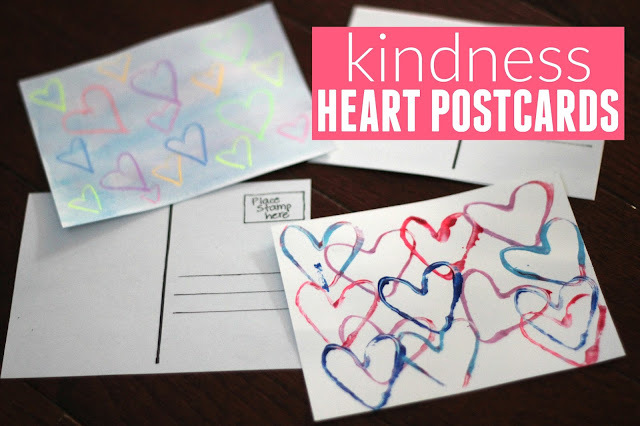 Our Week #2 Kindness Challenge is to mail a kindness postcard to a friend. 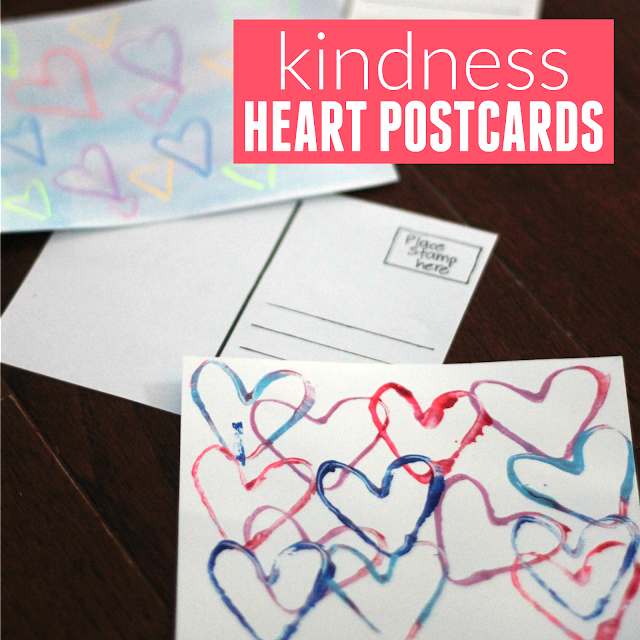 We made our own kindness heart postcards using three different painting techniques. You can try out one of our ideas, just buy a postcard and mail it... or even try out another art process idea that you like. On the postcard just tell your friends why you think they are great or tell them something you like about them. The friend can live near or far! With how infrequently we receive mail from friends these days it is such a fun surprise to get mail! Toddlers can dictate their ideas to parents while older kids can write their own postcards. To make our postcards we just cut a piece of cardstock into four pieces so that each piece was 4.25x5.5. 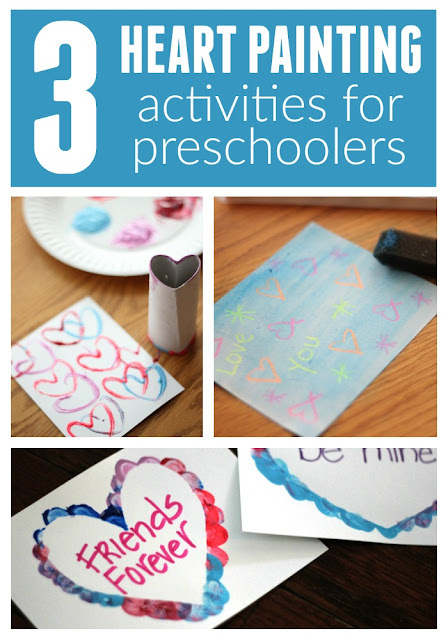 We learned about this printing technique from our friend Jackie at Happy Hooligans. 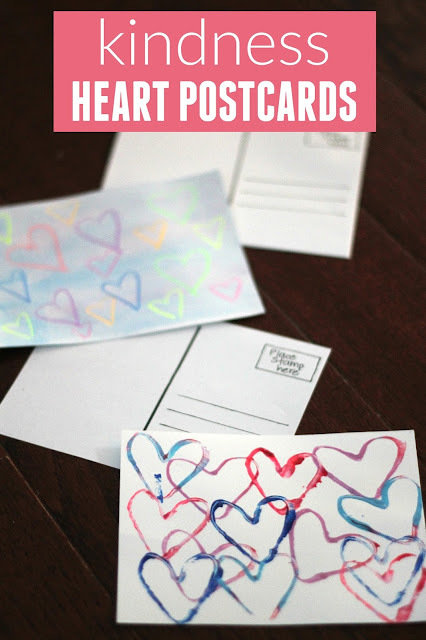 Go here for the stamping hearts tutorial from Jackie. 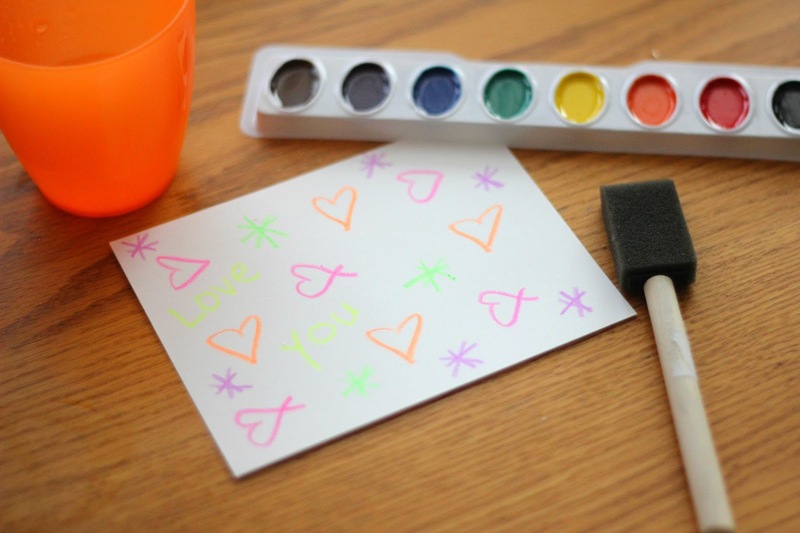 This watercolor activity was super easy. We just drew with crayons on the cardstock and then we painted over the crayons with watercolors. 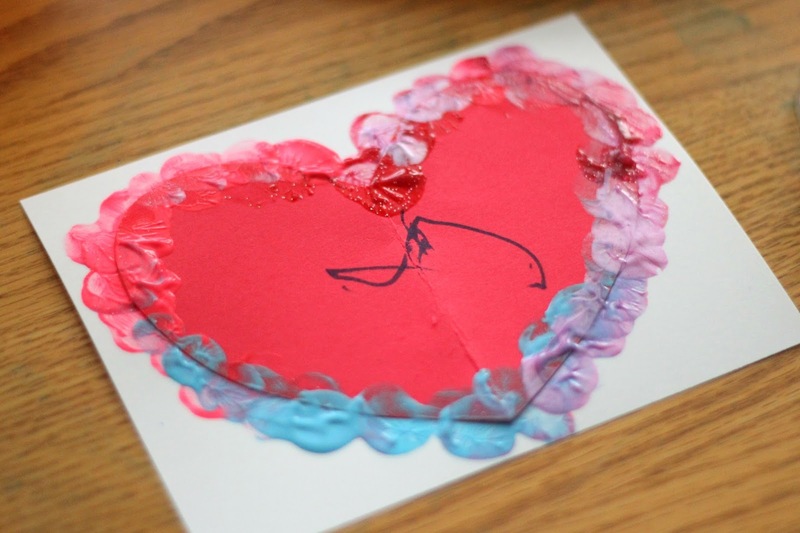 This heart art project is quick and fun. Just place a small heart cut out on a piece of cardstock and hold it in place with one finger while you make fingerprint marks with paint all around the edge of the heart. After you've made it all the way around, pull the heart cut out off and you'll have a beautiful fingerprint outline making a heart. Add a note inside the heart if you'd like. Once you've created your postcard design, download our postcard template, cut it in four pieces, and stick one to the back of each postcard design. Next all you need to do is write your note on the left side, add a stamp and address on the right side, and mail off your postcard to a friend! 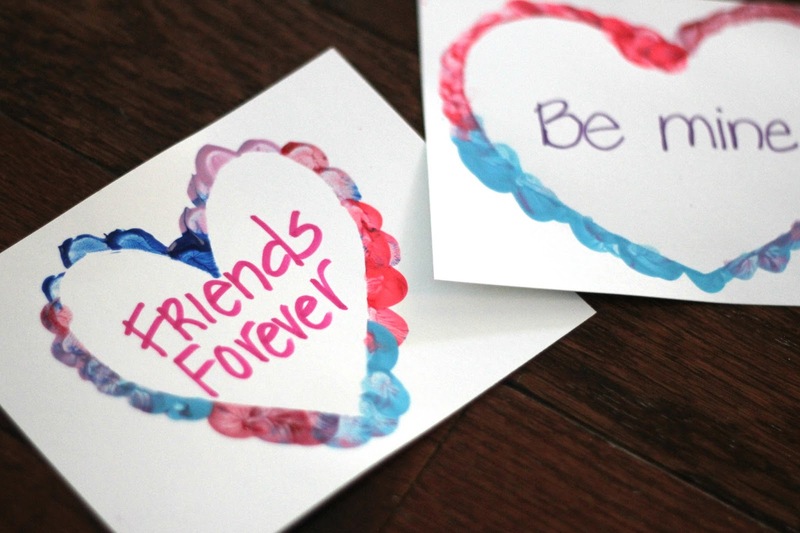 What friend are you going to mail a postcard to? Have you done any acts of kindness recently? This month between January 18th and February 14th we have taken a challenge to accomplish 100 acts of kindness! If you'd like to join in just come and join our100 Acts of Kindness Facebook group and we can all work together!